from East Africa to the Pacific and to the Americas. The Imperative of Migration by Land and Sea by Modern Humans from East Africa to the Pacific and to the Americas. In the first contacts made between the Spanish Conquistadors with the ancient Mesoamericans and South American Amerindians in the 16th., century, A.D. it was immediately clear that the invaders and their contemporary chroniclers believed that the evidence they saw first hand of the cultural achievements that confronted them had a close relation to those known in the Old World. This view pervaded in many of the later reports into the early 20th., century and evident also in the faltering first anthropological and archaeological researches of the Victorian era that were irregularly undertaken until they became more systematised. In the first part of the 20th., century, and perhaps a little earlier, some of the American researchers such as David Garrison Brinton began to insist that the American cultures on both North and South continents were indigenous and developed independently with little or no contact with the Old World. This view began to gain strength and popularity and became, in the second half of the 20th., century, the majority line in the educational establishments of the Western world. This was, and is so in the USA in particular whose educationalists have fiercely propounded their views and have in no way spared their invective or contempt for those who supported primary or even secondary stimulus of diffusion from Asia of Europe. Diffusionism from the Old World was relegated to the sidelines, although still maintained by some notable scholars, and Isolationism became the norm. Ancient migrations across the Alaska ice bridge from Siberia into North America have long been accepted and the open encampments and residual finds in rock and cave shelters have long been known and for the most part are firmly dated from Clovis - 11,000 B.C. or before. The so-called high cultures of Central and South America, however, reflect cultural upsurges in later times with so many similarities in expression, in symbolism and constructional forms and layout of ceremonial centres, to those of the Old World, that validate the diffusionist claims that rest on the proposition of later voyages across the Pacific and Atlantic in more recent ages dating from about the 4th., millennium, B.C. Radio Carbon dating, however, was to revolutionise modern archaeology and other techniques have pushed the beginnings of evidence for cultural development on all continents thousands of years beyond what were considered the first great or high cultures. In more recent years scientific analysis systems have become developed to such an extent that doubt raised by the C14 process were confirmed or determined by other methods. Of special interest are the latest developments in DNA analysis that are now resulting in "genetic tracking" of human diffusion from what is believed to be the womb of mankind - East Africa. DNA analysis has proposed that all of humanity that survives today is descended from the so-called "Mitochondrial Eve" who lived in East Africa about 150,000 years ago at the time of the emergence of the first modern humans. Only a few thousand years later there is evidence for a severe climate change, an Ice Age, and drought forced at least one of these modern human groups to migrate for a more sustaining environment in Southern Arabia. The recent researches into shell deposits on the beaches of Eritrea on the African Coast of Red Sea indicate that this group succeeded in the 11 mile crossing to the clearly visible Arabian Coast of what is now Yemen. From there researchers have shown that descendants of this group gradually migrated around the coast of Arabia to Iran and then to India. From there they travelled further into South East Asia across the now sunken land of Sunda, where now only the high mountains and volcanoes form the myriad islands of Indonesia. During the great, earlier Ice Age such a mass of the worlds water was frozen from the poles extending as vast ice sheets that resulted in the sea levels at that time being 400 feet lower than at the present day. It is known that the descendants of the Mitachondrial Eve had reached this South East Asian region, now Indonesia, since a remarkable and critical time marker is available to determine this certainty beside the DNA group profile. In about 72,000 B.C. the greatest known catastrophic event occurred - that of the massive eruption of Toba on what is now the island of Sumatra, and this datable event is the most catastrophic event in the last 2 million years. Stone hand tools of a type similar to those known earlier in East Africa and along this migration route were found deeply embedded in the ash and lava from this eruption providing a certain indicator of modern man's appearance in Indonesia. Having arrived in Timor these modern humans eventually set out for the Australian continent. The origin of the Australian Aborigines has long been debated but modern DNA shows that they are descended from the Ancient East Africans or the Mitachondrial Eve. Before the modern humans another group known as Homo Erectus occupied the large, pre-inundated land mass of Sunda to the North East of Australia, now Indonesia. They too are believed to have originated in much earlier migrations from Africa and it has been conjectured that they had developed a level of skills to be able to construct canoes sufficiently seaworthy to cross from one island to another. The modern humans that followed them into Sundaland set out after the eruption of Toba, perhaps a few thousands years later, on rafts or bark canoes across the 180 miles of open sea to Australia. DNA analysis clearly indicates that they are ancestral to the Australian Aborigines and therefore must have done so! This fact begs the question, firstly, of how these first humans knew of a land mass far from any possible sighting from the high points if the Sundaland mass and, secondly, how is that they were able to negotiate the very treacherous, shark infested waters with contrary currents that have seen many tragedies into the present day and, thirdly, how did they develop such mariner skills in navigation and craft capable of such undertakings. Recent researches in Brazil indicate from rockshelter debris and skeletal analysis, yet to be fully confirmed, that the closest parallels found in the oldest populations are with Aboriginal Australians, or Home Erectus of what was Sundaland, and the anomaly is that they could only have been in contact by diffusion across the Pacific, a vast distance that is unlikely to be explained by drift voyages. It is believed that a viable population to retain its own traits in isolated existence would have to number above about 250 individuals and this also suggest deliberate voyages rather than accidental drifts caused by typhoons or loss of direction to maintain a successful breeding population. The emergence of modern humans, Homo Sapiens, supplanting Home Erectus who also had apparent mariners skills, being able at such an early time to travel over both land and sea to diffuse into the Australia and New Guinea and probably beyond into at least some parts of the Pacific, suggests that Pacific voyages were being undertaken from that time up until the pre-European voyages of discovery on a more or less regular basis. It must be remembered that the sea levels were in the first emergence from Africa about 400 feet or more below present sea level and at the end of the last great Ice Age ending about 9,000 B.C. the sea levels were also about 150 feet lower than now. This indicates that migrations and settlements along what were coasts, and probably therefore the oldest human occupations during the Ice Ages, are now almost invariably submerged and will probably never be located having been scoured away by millennia of tidal action. Since the last Ice Age long distance sea voyages are confirmed between vastly disparate locations in archaeological sites on the coast of China, Japan and New Guinea from 5,000 B.C. It is unlikely that it is a coincidence that the excavations of the prominent American archaeologists Meggers and Evans in Ecuador led them to believe that there were more than a few contacts between the early Jomon of Japan and the coastal culture of Valdivia of Ecuador - a distance of about 10,000 miles. These date from the early 3rd., millennium, B.C. and may be seen as an extension of exploratory or sea trade voyages that extended to New Guinea over a millennium earlier from China and Japan and beyond. It is extraordinary to consider that, if from the first emergence of modern humans from East Africa into Southern Arabia, perhaps on inflated animal skins still in use to this day or simple rafts, to the dangerous crossing in sea-worthy rafts or canoe to Australia, and the more purposeful ocean-going trade voyages from China as early as 5,000 years B.C., along with the remarkable universally acknowledged navigational skills of the Polynesians in later millennia, that the anti-Old World contact Americanist lobby still maintain that there could not have be substantial contact between the Old World and the New across the Pacific Ocean. The Americanists have always maintained that there is no evidence that there had been contact or any major stimulus from the Old World into the New. The Spanish chroniclers at the Conquest thought differently and recorded their observations and beliefs on this matter. Not only are the constructional forms of the settlements through to the grandest ceremonial sites closely similar but, as would be expected, the iconography in principle appears to be closely similar. This wide range of iconographical references appear identical initially in many aspects before being assimilated to located evolutionary and design trends and these New World cultures appear to reflect many aspects of language that are clearly not naturally derived from the original Mongolian-Siberian origins of the first Amerindians who crossed into Alaska so many millennia before. Closely similar to their Old World origins are many myths and legends and these are of particular importance since there are so few written records left where writing occurred in Central America and where there are no written records in South America. Such oral traditions are traceable across the Pacific to Asia from whence they originated and form a body of work that is of great interest as well as being so evidential. Oral traditions are rarely reliable in terms of dating but frequently amaze the researchers with assertions that are truly extraordinary. When many of these were first recorded they were considered "foolish" and worse and were simply not recorded. This is certainly true where sexually explicit references were not approved of by those who recorded them. However, some of the myths were recorded regardless of whether they were understood and many of these contain references that appear to have remarkable parallels in modern scientific research. References in myths and legends to periods of great famine appear to be validated by present day archaeological researches as well as periods of great floods or inundations. These often appear to relate to what is now known as the El Nino effect, a phenomenon that has received much attention in recent years and such events are now critical in dating South American coastal sites. Of special interest are references in myths to waterspouts and related catastrophes that appear to relate to meteor strikes and the resultant long years of "winters" that followed. In considering the transfer of specific aspects of myth and iconography from Asia and India in particular the god good luck, trade and commercial relationships who received the adoration and propitiation from long distance traders and mariners, among other devotees, was Ganesa. This deity was usually depicted in anthropomorphic form with an elephant head and he is unusually depicted in identical forms in Central America among the Maya. In other iconographical aspects he is shown wholly as an elephant particularly so in early Buddhist carvings. It is in the exact Buddhist form that one of the great stelae at Copan exhibits references identical to those of the calendrical iconography at Sanchi in North Central India dating from the first century B.C. This Copan stela is so closely similar to the elephant heads carved at Sanchi that a century ago this Mayan carved monolith was known as the "Elephant-stela". This Mayan example was originally complete with its mahout or driver and the first photographs illustrate one surmounting the elephant heads. The Hindu elephant deity Ganesa (left). 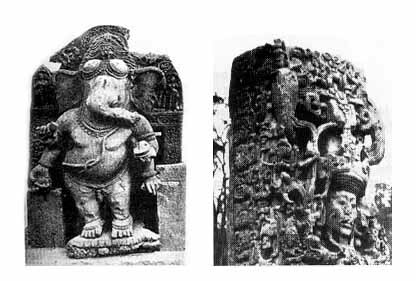 Kitching, Orissa, Eastern India, 8-9th century A.D.
Stela B, so called Elephant Stela (right). Copan, Honduras, Early 8th century A.D.
Other depictions in Mayan carving illustrate the elephant head even more clearly in the form in India. A vase from Yalloch in the Classic period of Mayan civilisation in Guatemala clearly depicts a version of the elephant probably derived from a verbal eyewitness of the India prototype. The colour and legs of one of the depictions is clearly that of the elephant and illustrates the exact form of the elephant goad used anciently to this day in India projecting upward from under the arm on the right side of the illustration. 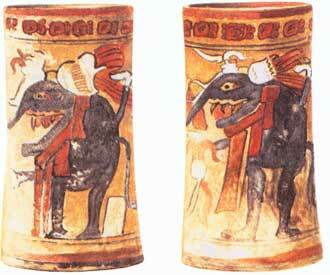 Of special interest is the fact that both illustrations of the elephant on the same vase are illustrated from the rear view - almost unknown among the Maya but common in India. Rear views were most common in the early Buddhist imagery from the first millennium B.C. for at least a millennium. There are other reported examples of Mayan iconography a fine sketch from Count Waldeck's expedition to Palenque in Southern Mexico in the mid-nineteenth century illustrates an plaster elephant's head but was rapidly corroding even at that date and is no longer detectable. A ritual vessel from the Classic Maya showing what appears to be an elephant deity depicting reasonably faithfully, probably from a mariner's description from Buddhist or Hindu India, this special deity as Ganesa - the god of protection and luck in ventures. [...] Yalloch, Guatemala, Late Classic, 600-900 A.D. The elephant is only one of many transferred aspects of Old World culture and is included here to indicate that these aspects are evident even in the present day. The iconography of South America is, in its own assimilated form, as evident of Old World influence and in the later, final Andean Empire, the Inca themselves appear to have preserved their origins from the Aryans of India. The revered title the Inca's retained for their clan was Ayar and this along with many other aspects of culture clearly derive from the Arya of India or Iria from Iran, reflected in the term Irihia of the Maori. The Inca's themselves appear to have followed in the marine highways from India to South America that were long establish millennia before In the works of this author it is shown that Tiahuanaco and other associated and earlier civilisations in South America could only have been established from Asia and were a result of stimulus diffusion from Ancient Mesopotamia and India. In so doing these ancient peoples were following in the footsteps of the first distantly related peoples descended from "Mitochondrial Eve", and her associated clansmen and their descendants, in their initiatives through South Asia to Australia and Oceania. The diffusion from Central West Asia into India and through to the Pacific is readily traceable in any serious study of archaeology, iconography and myth. It is shown, and will also be indicated in future projected works, that from this same part of West Asia that there was a return into Africa and through the Mediterranean to the Americas and that much of the present day cultures in Africa in particular are descended from these intrusions. Alva; W. & Donnan; C. - Royal Tombs of Sipan, University of California Press, 1993/4. Baille; M.G.L. - Marking in marker dates: towards archaeology with historical precision, World Archaeology; Vol., 23, No. 2, Oct., 1991. Bandelier; A.F. - Titicaca and Coati, Hispanic Society of America, 1910. Brinton; D.G. - American Hero Myths, Watts & Co., 1882. Burger; R.L. - Chavin and the Origins of Andean Civilisation, Thames & Hudson; 1992. Cobo; B. - Inca Religion and Customs, University of Texas Press, 1990. Kolata; A.L. - The Tiwanaku - Portrait of an Andean Civilization, Blackwell/Oxford, 1993. Meggers; B.. - Ecuador, Thames and Hudson, 1966. Oppenheimer; S. - Eden in the East; the Drowned Continent of Southeast Asia, Weidenfeld & Nicholson; 1998. Oppenheimer; S. - Out of Eden: the Peopling of the World, Constable & Robinson; 2003. Poindexter; M. - The Ayar-Incas, Horace Liveright Publishers, N.Y., 1930. Did the ancient Buddhists, Hindus and Jains transfer cultural influences into the Americas? Who were the mandeans and were they among the enablers and traders who influenced the Maya? I have long been interested in ancient cultures and particularly those dispersing from the Biblical lands of the Middle East and India. I have written three books on this subject. My most recent book, "Inca Origins" deals with the distribution of ancient culture from India and Mesopotamia to South America and the effect and origins upon the native peoples of the Andes. Cross-Pacific voyages are very controversial and are not acknowledged by the more conventional schools of history and archaeology although by no means exclusively. In this research there are many aspects of Pacific cultures and those of the Americas that have long been considered reflected of the Ancient Middle East. These have not been given due attention in recent research and I have attempted, among others, to give certain aspects that appear to suggest that the Syrian Christians in South India reached the Americas and that traces remain into the myths and archaeology recorded at the Spanish Conquest and into modern times. Such contacts were facilitated by centuries of cross-Pacific voyaging by Hindus, Buddhists and ancient Middle Eastern peoples. Were the Incas from India? Was ancient Peru a Domain of the Four Quarters of ancient Babylon and Assyria? The Incaís social system is said to be uniqueóor was it? Tiahunacaco was the high point of Andean civilizationówhat were the connections with India, Tibet and the ancient Middle East? Ancient Peruvian textillers were among the finest ever createdóbut are they closely linked to, and even derived, from ancient India? Did Buddhists transfer Indian culture to the Americas? Mayan Genesis author Kearsley examines identical imagery on the opposite sides of the Pacific and concludes that ancient Peru and vicinity were colonies of ancient India. Chapters include: Ancient Trade and Migration from India to Australia; Mariners and Migrations from Australia to South America via South Polynesia; Southern Pacific Coast, Highlands and Gran Chaco Through to the Preceramic in Peru; Moche Splendor and the Greatness of Tiahuanaco through to the Inca Origin Myths; Clans and Cosmology in Peru and India Reflected in the Empire of the Incas as Tuantinsuyu; Viracocha and the Testimony of Tonaca; The Four Quarters and the Sun in Ritual and Myth; Mariners, Sun Myths, Tupac and the Pacific; The Tukuno Desana and the Great Legendary Voyages of the Polynesians from; more. Packed with color & bw illustrations. One of the most famous monuments in the Americas. Was the Mayan sky band derived from the Buddhists originating in the caves of Ajanta? Were the sacred Buddhist caves of Khotan the prototypes of the Niche Stella of the Maya? Graeme R. Kearsley is an architect who has maintained a life-long interest in archaeology. He was born in New South Wales in Australia and began his architectural training at the University of New South Wales in Sydney. After five years he travelled to the U.K. and after some years recommenced his architectural studies at Thames Polytechnic (Greenwich University) where he graduated in 1977 with first class honours.